Shand, 89, was surrounded by family when he died at home in Dorset, on England's south coast, said the spokesman for Clarence House, the residence Camilla shares with her husband Charles, the Prince of Wales. He said that Camilla was "absolutely devastated." Clarence House did not comment on the cause of Shand's death, saying only that "he had been unwell for some time." The Duchess' engagements for the week ahead have been canceled and she is unlikely to attend celebrations on Thursday to mark the Queen's birthday, the spokesman said. Charles "was extremely fond of the major and is very upset at the news," the spokesman said. Clarence House said plans are being made for a private family funeral. Shand, a former cavalry officer, was credited with giving his daughter steadfast support when she was publicly vilified as the cause of the tensions that led to Charles' divorce from Princess Diana. Asked in 1994 about the publication of transcripts of explicit phone conversations between Charles and Camilla, Shand responded: "Let's just say highly intrusive." 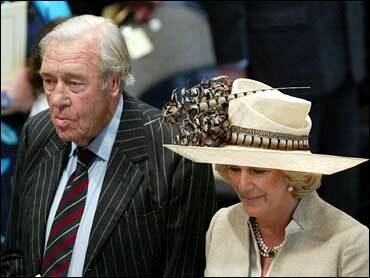 He later praised Charles for his honesty in admitting he'd committed adultery with Camilla. "I believe he came across as very fair-minded and sincere," Shand said. "I am in no doubt he will make a perfect king." Charles and Camilla wed last year. Shand was honored as a hero during World War II, even before he was wounded by a bullet to the face during the battle of El Alamein in Egypt in 1942. He was captured by Nazi forces at the battle and held in a German prisoner of war camp until 1945. After the war, he found work as a partner in the London wine merchants Block, Grey and Block and pursued a passion for hunting in his free time. His wife, Rosalind, died in 1994. The couple had three children — Camilla, Annabel and Mark.